Paradise Lashes - Beautiful YouLash Lift or Eyelash Extensions? Which Service is Better for You? Lash Lift is the eyelash service everybody's talking about! Whether you're on a new quest to simplify and enhance your make-up routine with a lash service or are seasoned to eyelash extensions, It's very likely that you have heard about the relatively new, trending eyelash service called Lash Lift. Lash Lift is a re-branded and improved method of Eyelash Perming used to curl or "lift" your natural lashes using cream based products. If done correctly, beautifully lifted and lengthened natural eyelashes are revealed. Add on an Eyelash Tint for dark, smudge-proof lashes with results lasting up to 8 weeks. It's easy to see why Lash Lift has become such a popular service, but how does it compare to Eyelash Extensions and is Lash Lift right for YOU? If you would like to take your lashes to the next level, I'm going to help you choose between Eyelash Extensions and Lash Lift by breaking down five important differences between these two services. Looking for a dark lash-line? Then Eyelash Extensions are the choice for you. Your Natural Lashes: What do your natural lashes (sans mascara) look like? This includes thickness of each lash and general fullness. With a Lash Lift your lashes will appear curled and somewhat lengthened due to them no longer pointing straight or downward, but they will not appear thicker/fuller. 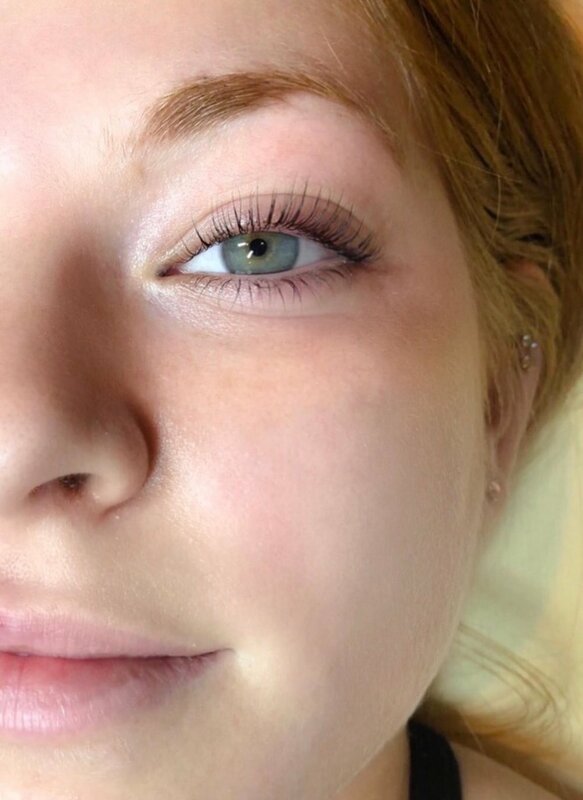 So, if your lashes are naturally on the fine/sparse side, you would benefit from Eyelash Extensions, which can add different levels of fullness and thickness to the lashes with different techniques (for Classic vs Volume click here). Look: Let's say you already have a good amount of overall fullness but are looking for a "fake/eyelash strip" or "dramatic" look. In this case, Lash Lift is probably not for you. A Lash Lift is a very natural enhancement and does not add the darkness to the lash line that Eyelash Extensions do. Eyelash Extensions also add symmetry and shape. So even if you are looking for a "natural" look, a Lash Lift will not shape your lashes; it will only enhance what you already have. Time: Eyelash Extensions take TIME. No matter how experienced your lash tech is, if they are applying your lashes correctly you're looking at 2 to 2 1/2 hours for a full classic set and up to 4 hours for a volume set. It is totally worth it, but not many people have the time (or patience) to hang out for that long with their eyes closed. In comparison, a Lash Lift usually takes under an hour, add on a Lash Tint and you're looking at 1 hour 15 minutes max. Maintenance: Here's the game changer for most clients. Eyelash Extensions are a beautiful luxury. They extend, fill, create symmetry and enhance your eyes in an incredible way. But they do require at-home care and changes may need to be made to your cleansing and make-up routine. If you decide to have Eyelash Extensions long-term, you will also be required to make regular 2-3 week visits to your lash tech for touch-up's or "fills". On the other hand, Lash Lift doesn't require much after-care and lasts 6-8 weeks. Touch-up's for Lash Lift are not needed in between. Budget: If you're on a budget and looking to try a lash service, you will most likely gravitate towards a Lash Lift for it's affordability. A Lash Lift can range from $75 to $100 depending on the area/demand where as Eyelash Extensions range from about $150 to $300+ for a full set. I personally recommend taking your time to do the research and deciding what would benefit YOU the most before rushing to make an appointment for the most cost effective service. If you find after researching that you are still having doubts about which service is best for you, I encourage you to find a certified and reputable lash artist in your area. You will find that a good lash tech is always happy to give you a consultation before you commit to an appointment. ← Eyelash Extensions- Classic or Volume?